Exposure: 6 x 300 sec H-Alpha exposure, 12 x 60 sec Luminance exposure with IR block, 8 x 45 sec (2x2 bin) RGB exposures. Processing: Images were captured in Artemis Capture (as FITs). Aligned/stacked in Registax 3 and saved as FITS. Luminance and Color channels were scaled and rough color balanced in Astroart. Channels were co-registered in Astroart. Final LRGB combine was done in Photoshop using Luminance Layering (or LLRGB). IR block exposure data was mixed with the H-Alpha exposure data to construct the luminance channel. Brighter star sizes were managed with a light minimum filter applied with mask. Color balancing and final touches were done in Photoshop. SGBNR was used to smooth background noise on the luminance construction and the final result. Final Image size is approximately 1392x1040. North is to the left in this image. The image was guided for all exposures. M38 is the star cluster in the upper left in this image. The smaller open cluster just to the right of M38 is NGC1907. 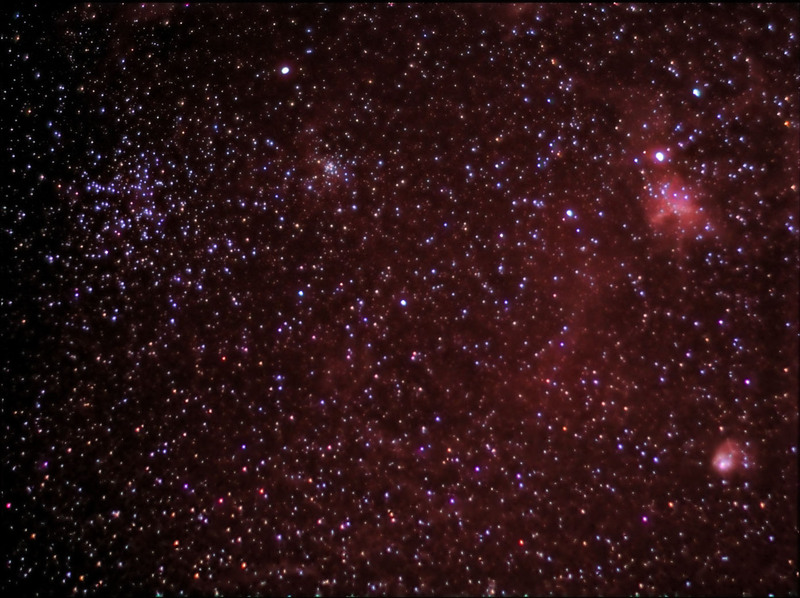 Further to the upper right is an emission nebula, IC417, and finally in the lower right is a nebula, NGC1931. This field has a diffuse hydrogen emission background that can be seen in this image as a dim reddish hue. M38 is one of several Messier Open Clusters in Auriga and is often compared to its cousin M37 about 6 degrees away. M38 age is estimated slightly younger at 220 million years; its distance is estimated at 4,200 light years. A close up of M38 can be seen from an an earlier image in the Archives here. Horizontal FOV is 120'. Image center is approximately - Equatorial 2000: RA: 05h 29m 43s Dec: +35°06'31"